Danish school children should learn about the Charlie Hebdo shootings and Mohammed cartoons at school, the country’s opposition parties believe, saying the recent terror attacks are now an important part of the history of the modern world. “The cartoon crisis, the Charlie Hebdo killings and the latest terrorist attack in Copenhagen on February 14 are such an important part of history they should have a permanent place on the school curriculum,” Conservative People’s Party spokeswoman Mai Mercadowrotein the Jyllands-Posten newspaper. The paper sparked controversy and anger from the Muslim world in September 2005 after publishing 12 cartoons of the Prophet Mohammed, including one of him with a bomb in his turban. Since then the paper has received numerous death threats. Mercado added that teachers will be free to choose whether to reprint the controversial cartoons in students’ textbooks. 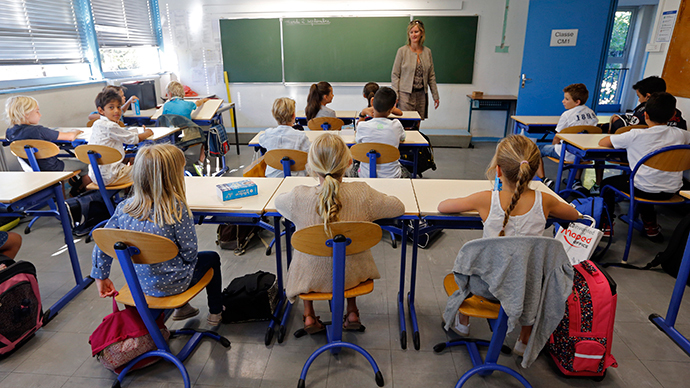 “Politically we don’t regulate the details of what students are taught, that’s an old tradition to make sure that Danish schools are kept free from political interference,” she told AFP. Even if teachers don’t show the Mohammed cartoons to children during lessons, they“would go home and run a Google search”because kids are naturally curious, Mercado believes. Another opposition party, the Danish People’s Party (DF), which has 19.6 percent of voter support, according to a recent poll, also supported the idea of ‘Mohammed cartoons lessons.’ Party members say that studying the Charlie Hebdo related crisis and its aftermath should be mandatory in all the country’s schools. While the Conservatives want the cartoons to be taught in history class, the Danish People’s Party say it should be done in religious studies. ”One of our time's great challenges is the threat from Islamism and the pressure on freedom rights that have built up over many years,” said Martin Henriksen, the DF immigration spokesperson. According to the country’s teachers' union head, Anders Bondo Christensen, it’s up to teachers to decide how to present the subject during lessons. In an interview to the Ritzau news agency, he suggested that "perhaps invite some Muslim children's parents to explain why it provokes" them. John Rydahl, president of the Danish Association, thinks the cartoons should be reprinted in students’ textbooks. "The Muhammad crisis is an obvious topic for R.E. [religious education] teaching, and I'm surprised that so far no textbook has reprinted the cartoons. That should happen - and sooner rather than later," Rydahl told DR News. Reportedly, many Danish schools already teach the Mohammed crisis in grade 9, but it’s not compulsory. On January 7, gunmen attacked the office of French satirical magazine Charlie Hebdo and a kosher shop in Paris, killing 17 people. The shootings provoked massive public response in France and across the EU. Two million people joined a rally in Paris on January 10-11, and up to 3.7 million gathered across France to honor the victims. Newspapers and magazines reprinted some of Charlie Hebdo’s cartoons. As a result, a German tabloid in Hamburg was attacked with an incendiary device on January 11. On February 14, one civilian was killed and three police officers were injured after shots were fired at a cafe in Copenhagen during a free speech discussion attended by controversial artist Lars Vilks and the French ambassador to Denmark.